In the early 2000s Sandy and Henry Sutton decided they’d had enough of Connecticut. They wanted to drop out of the New York corporate world they both had been working in and were looking for something new to do. One of Henry’s goals was to relocate back to the Southeast part of the country, since he’d been raised in Florida and Alabama (Sandy had been raised in Texas) and they both missed the South. So, they started shopping for businesses and, although the couple says they saw some great opportunities elsewhere, when they discovered a sweeping business for sale in the Florida panhandle, it struck a chord with them. Although they knew nothing about sweeping, when they saw the opportunity, it was the one they chose. Everything seemed to fit: the price was right, the opportunity was right and the market was right. In 2005, they decided to buy the business , move to the Ft. Walton Beach area and take over as owners of a sweeping company. Although the business had gone through three owners in the previous five years, what the Suttons saw via the company records was that it was a decent business opportunity. The Suttons weren’t able to rely on introductions from the previous owner, since he had commitments elsewhere. So, Henry took it upon himself to go meet and visit with the company’s clients. The Suttons were able to keep an estimated 80% of the existing customers. The ones that left, they say, did so right away, not because of any reduction in the quality of service being provided. And, of those who left, all but one returned within a year. Sutton thinks they came back to him because he was professional in his initial meeting with them, and able to show a sophisticated level of understanding about their needs. While there’s no way to know what happened with the service level these property managers received when they went elsewhere, what subsequently occurred shows the importance of being professional in all circumstances, especially when losing a client. In fact, that situation is one that perhaps calls for the utmost in professionalism even though that is often also the most difficult situation in which to retain composure. One change the Suttons have seen in their NW Florida market area in the eight years they’ve been operating Clean Sweep is a shift in the demographics of their customers. When they first started, most of their clients were local . Today the reverse is true; most are located out of state. As a result, the Suttons believe it is more important than ever to take care of customers’ needs. Remote managers need to know that once an assignment has been given to Clean Sweep, they can forget about it, knowing that whatever needs to be done will be handled promptly and correctly. In terms of the company’s sweeping routes, with the exception of one route, the Suttons run one person on a sweeper. The operator does the backpack blowing first, then operates the sweeper to pick up the debris. The decision to operate in that mode was directed by a combination of economic factors and account requirements. For the same reasons, the Suttons have developed a mixed fleet between twin- and single-engine sweepers. To date, their machines of preference have been Schwarzes. In his audio interview, Henry Sutton emphasized how great his employee team is and how positive the relationships are — both between management and employees and between the employees themselves. As a result, while there’s no question who is the boss, he regards his employees as family. His commitment to his workers shows up in a variety of ways, one of which is a strong emphasis on safety. Most employers don’t want anyone to get hurt, but Henry’s concern goes beyond that. He doesn’t want anything to disrupt his team. “We have such a great team that it would truly be a shame to have to do so,” he said. An aspect Henry also stressed is to narrow down your workers to those who are happy working their shift, whether day or night. In the long run, he says, that’s a key to keeping everything running smoothly and minimizing turnover. He also does his best to accommodate them if they need a day off because of sickness, family issues and so forth, recognizing that personal issues do crop up from time-to-time. When the subject of third party vendors (aka national service providers) was brought up, the Suttons estimated that probably about 30% of their current business is done through them, and quickly pointed out that some third party vendors much better than others to work with. “Some of them are so darn good that I don’t even think of them as a third party provider,” Henry said. “Others I won’t even discuss publicly. First, you have to get past the contracts. They provide the contracts so they make the rules. With some of those we make adjustments by scratching things out; some contracts, however, are so bad that I don’t even bother with them. The audio podcast goes into this issue in further detail. However, if you cannot take time to listen, perhaps the central theme to consider is that other contractors out there are also starting to balk at signing onerous contract clauses. And they’re finding that if they request contract flexibility the can get the concessions they need. Henry pointed out that third party vendors need to salvage the contracts they, too, have signed, especially if it’s a junior account rep whose mandate is simply to get contractors to do the job so they look good to the hiring retailer. Also discussed was the value of the World Sweeping Association’s roster and ratings for third party vendors, and what a help that is for WSA Members. Henry said he found it curious that retailers who switch to the remote vendor system don’t do a more thorough job of checking with the local sub-contractors about the reputations of the third party vendors they’re considering before they hire them. Some of the reputations are such that, if there was full disclosure, Henry doubts the retailer would award contracts to these companies. When asked what they think has been responsible for them making a success in their market area, the Suttons cited their quality work product as number one. “When you say you’re going to do something,” said Henry, “you’ve go to do it. Plus, I think it’s important to be professional in all of your dealings with your customers because they are professionals. We show our clients that we’re there and that we’re doing more than they ask. 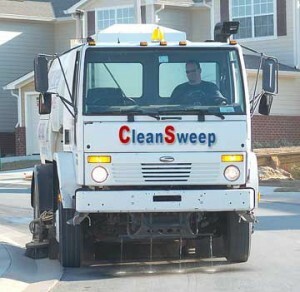 Sweeping contractors reading this will also enjoy and, perhaps, learn from the audio podcast’s analysis of the different types of chassis and sweepers, including pluses and minuses and the Suttons’ experience with different types of Schwarze units. There is also a discussion surrounding why price increases have been so difficult to come by in the sweeping industry, along with the challenge to find the dollars to cover cost of living increases over the past few years. When the Suttons were asked their advice for other contractors, “If I were to list three things,” Henry said immediately, “they would be these: First, treat your clients like your children. In other words, take very good care of them. Do what they ask and do more than what they expect. Be over and beyond with everything they expect and be professional with them. “The second item would be to recognize the value of your employees and treat them like family. Do everything you can for them. Make sure they treat you with respect, but if you treat them that way, then it’s almost automatic that they will do the same to you. Recognize they have needs and families and work with them to make their lives better. 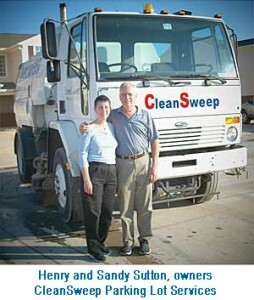 You may reach the Suttons via their company website, which is www.SweepFlClean.com.